Fermentation | how do you like them green apples? If there is one thing I’ve adopted into my regular repertoire over the last couple of years, that has completely changed my life (indeed, a flat bread CAN change your life) -it’s been this wonderful low carb, high protein, unprocessed gem. Like many of you, I moved away from bread and the dear ol’ sandwich long ago, for a many reasons (the least of which was after eating the darned things every day for 12 years of school, they sort of lost their… charm). I also discovered I had wheat sensitivity and could only really eat spelt/rye bread, and in this regard, preferred the naturally fermented/leavened sourdough variety. While this is still nice for toast, it’s not great as a sandwich. It’s pretty dense and truthfully, I don’t enjoy eating such heavy starch/carb based meals anymore- so, when making a quick lunch at home or for work, I would often use wraps. I tried many store bought varieties. The Mountain bread ones had the least amount of crap in them, and I admit I still buy them from time to time, but let’s face it… has ANYONE successfully been able to eat a wrap with one of those things and not have them fall apart…? The other brands use varieties of humectants (made from glycerine usually), emulsifiers and gluten to give the wrap more elasticity. “Vegetable oil” This is almost ALWAYS SOY oil, and if there is one thing you can take the bank, it’s that if it’s SOY and it’s NOT organic, it’s genetically modified. So aside from the highly processed, bad-for-you, rancid nature of the fat- it’s a plant that was never found in nature- AVOID IT LIKE THE PLAGUE. I have also heard a theory that because there is so much vegetable oil in SO many foods, people are actually getting quite a high dose of soy. Soy suppresses thyroid function (among other things), and so it may be contributing to chronic low grade hypothyroidism associated with obesity (rampant in the west). Interesting theory. “Canola oil” Sadly, like soy above, it’s one of the major genetically modified crops of the world. If it’s not organic, just assume it’s a franken-food. As you can see, LOTS of reasons to avoid the oils in processed/manufactured foods. In my quest to find the perfect, quick, easy, bread-like food for lunch, I tried many things. Some were a great success, but they perhaps took too much time to make, and were messy- like making your own lavash bread. 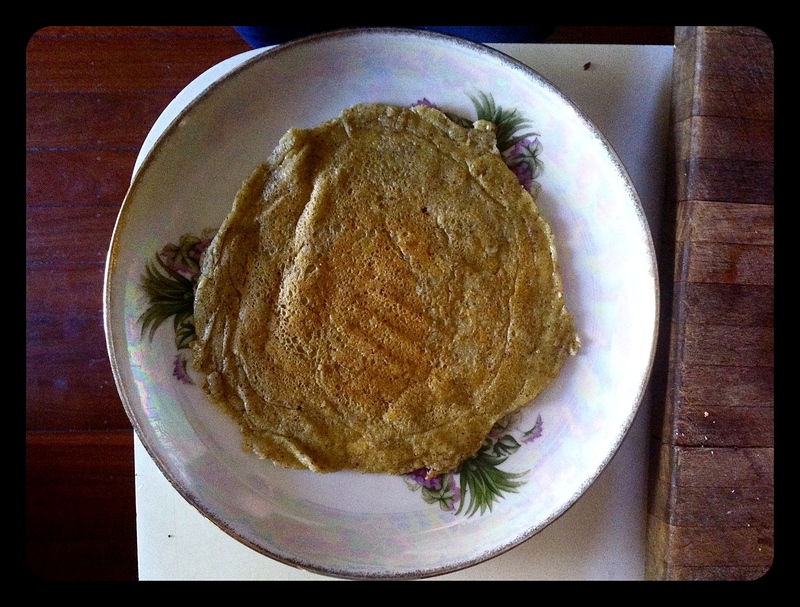 Lavash breads are great, and are used in a different way to this dosa/crepe like bread. I still make them, for particular meals, when I have a plan of action and the time, but on a regular daily basis, I found the work and mess involved not sustainable. This recipe is great, because you make up the mixture, keep the “batter” in the fridge, and make it up as needed. It takes very little time and there is no rolling out of dough or splashing of flour all over the counter. It’s fermented (I will be singing the virtues of fermented foods in other posts) , and can be made without flour or gluten. It’s also sprouted- a TRUE WHOLE FOOD. So let’s get to it! Raw buckwheat, mung beans and quinoa ready for the soak. Like all of my recipes, I’ll give you a basic start up example, and then some suggestions on how you may adjust them and make them your own. 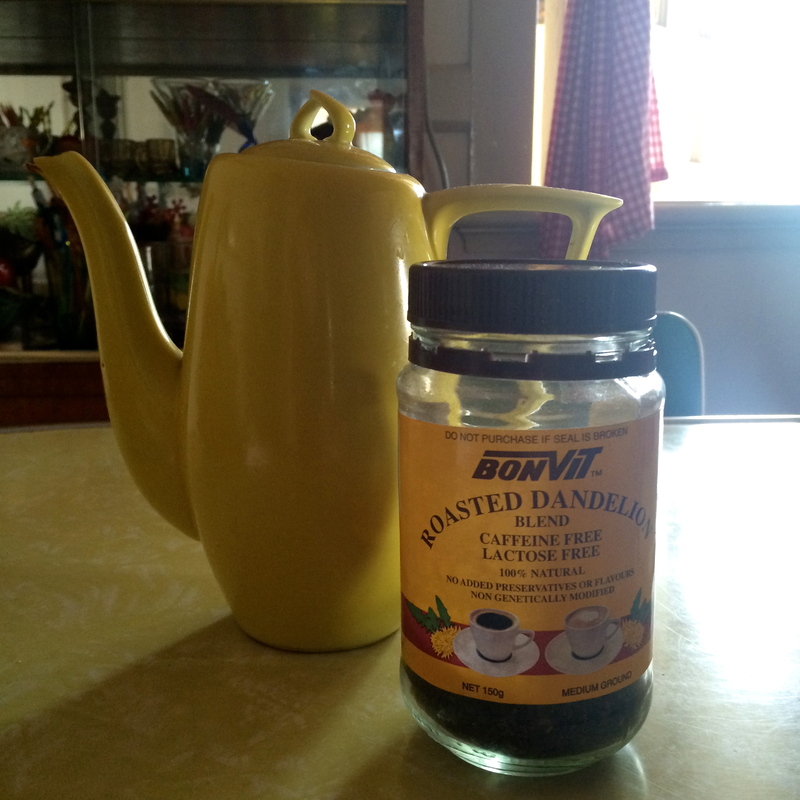 The list below is my every day basic recipe that I use and love. 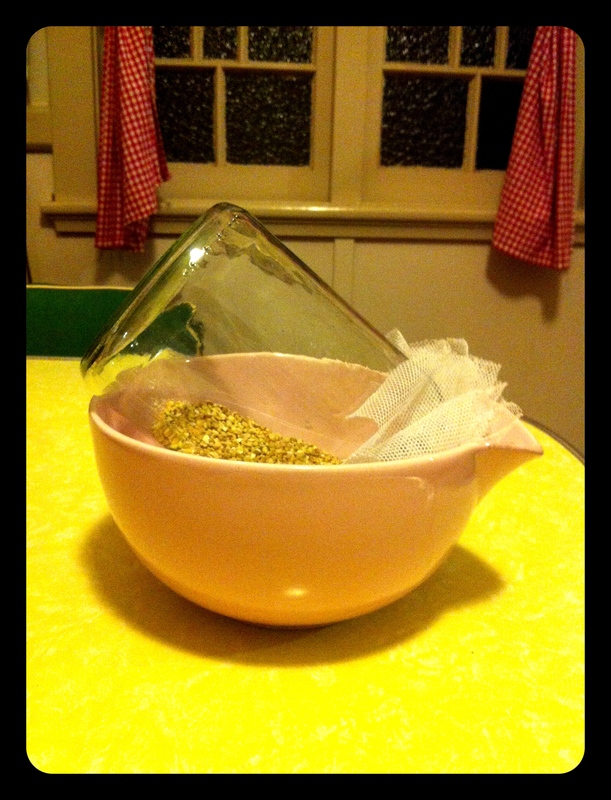 STEP 1- SOAKING- I often soak the seeds (Buckwheat and quinoa are seeds NOT grains. They are also alkalizing-unlike grains, and gluten free!!! WIN!!!) and the mung beans before I go to bed (as you see in the bowl above). Now you can soak them in a bowl, OR a large mason jar. The jar is easier if you want to take the recipe a bit further and sprout the mix in the next step. 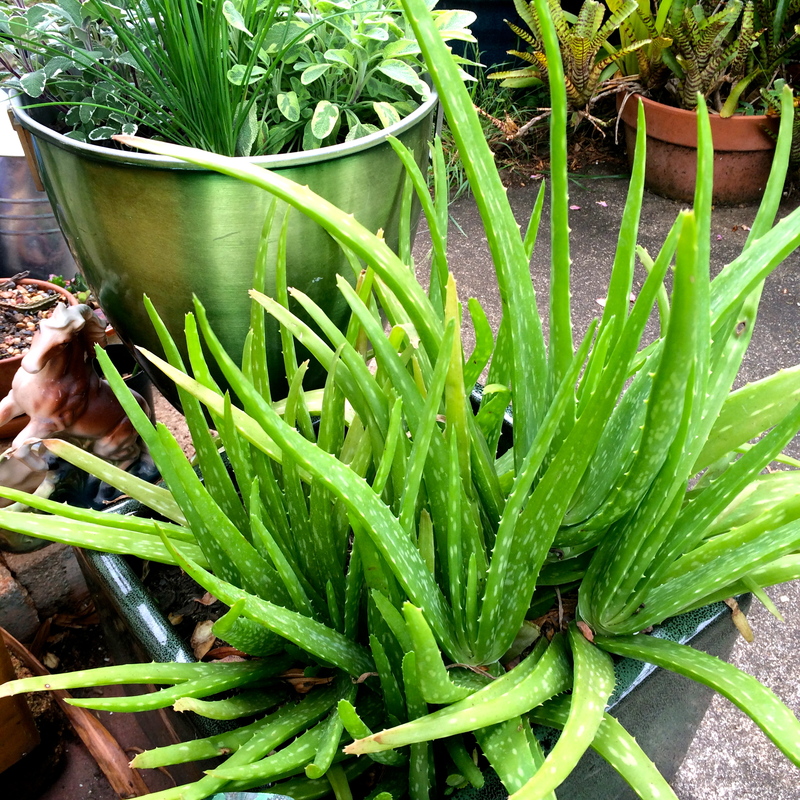 Cover with a good double the height in water, as they will expand and soak up the water. You may need to add more in the morning if it’s gone dry. In the morning, before I go out, I pour the mix in to a sieve and rinse well, this gets rid of the starchy water the buckwheat makes…it’s quite thick. STEP 2- SPROUT- So, if you’ve been soaking in a bowl, you’ve rinsed your mix and then you simply put back in the bowl and cover with new fresh water, and go about your day. This mix WILL begin to sprout in the water, though not as much. If you are looking to really increase the vitality and nutrition of the mix, you will have soaked it all in a large mason jar, placed a bit of tulle (I bought some from a craft store and cut it up into squares big enough to cover the mouths of jars) over the top of the jar, and secured around the rim with an elastic band. So once you’ve rinsed the soaked mix, you put the jar (mouth covered in the tulle) on it’s side in an appropriate sized bowl- and leave it for approx 8 hours. Depending on the temperature, the mix will sprout at different rates. So you see, if you’ve soaked over night, rinsed in the morning and put in the bowl, you can go to work or get on with the day, and leave it to do it’s thing. Works well with the rhythm of the average day. 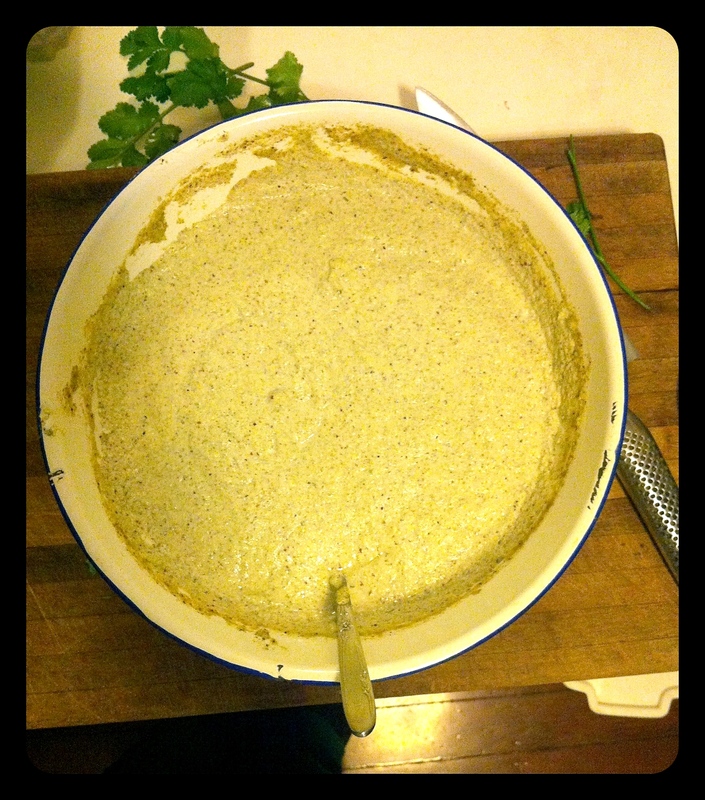 After rinsing the soaked mix, the jar is placed on it’s side in an appropriate sized bowl. 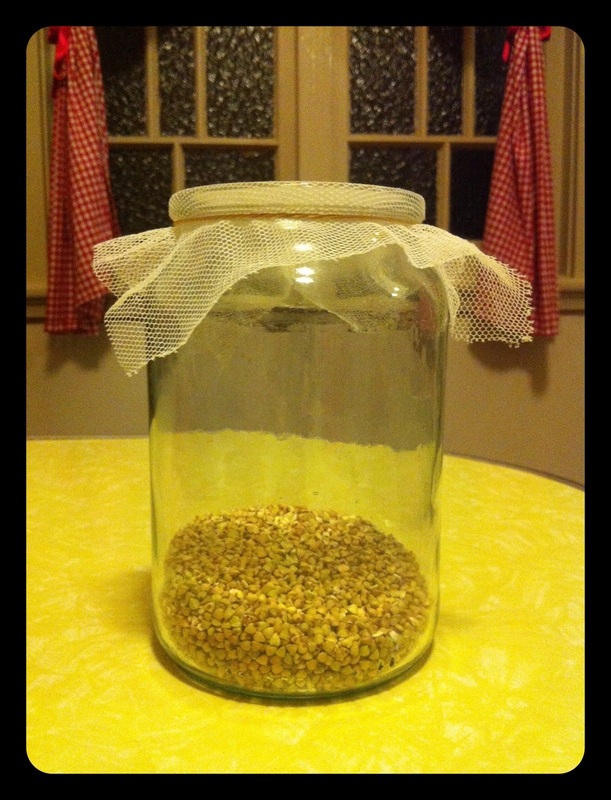 This allows excess water to drain out of the jar and provides the ideal environment for the seeds to begin to sprout. STEP 3- BLENDING- So, after approximately 8 hours, you are ready to blend your mix. If you’ve just left it soaking in the water, it will have begun to sprout slightly and you may notice some small points or bumps coming out of the mung beans/buckwheat. If you’ve done the sprout method, you will know you are ready to blend when the mung beans and buckwheat kernels and the rest have those little “tails” growing out of them. I like to give them another good rinse, before pouring the mix in to the blender jug. Now again in this situation, it’s my experience that you need an actual blender for the best outcome. A bar mix and most food processors won’t get the mix smooth enough. The next part is a bit tricky. 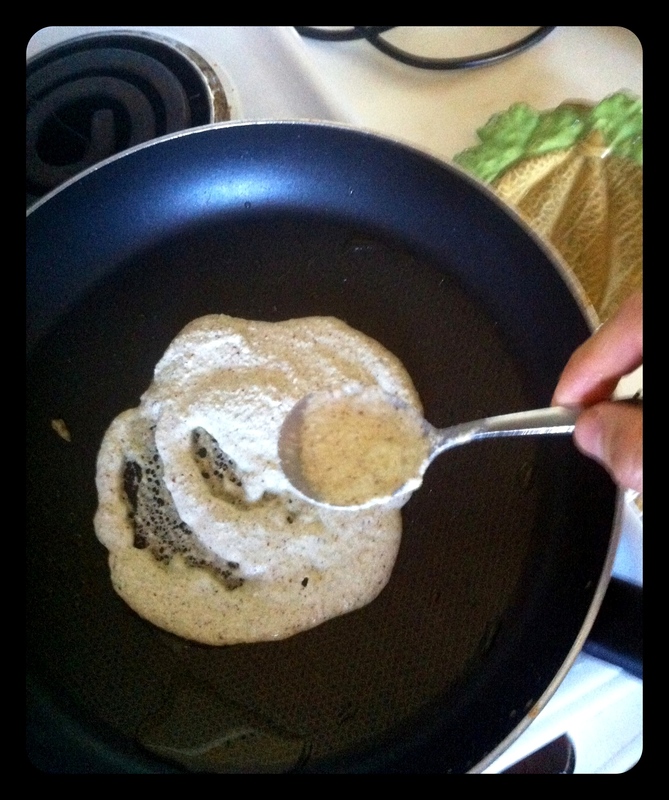 You basically want ONLY enough water to blend the mix to a smooth, pancake batter type consistency. Thick, but still liquid. So when adding water to the blender jug, start off with a small amount. See how easily it blends. You may find you need to add a bit water until the mix is blended and seems to move smoothly around in the jug. If you’ve added too much water it’s not the end of the world. You can always add flour to the mixture to thicken it at the end, however, it’s not ideal. The consistency of the blended mix should be similar to pancake batter- smooth, and liquid but thick. Add flour (gluten free or spelt) if you’ve accidentally made your mix too thin. Stir it into your batter, and cover with a tea towel and leave in a warm place, for about 8-12 hours. If you’ve been working with the rhythm I suggested, it usually means just leaving it again over night. At the end of that 8-12 hours, you can simply pour in to a jar and place in the fridge to be stored until used. 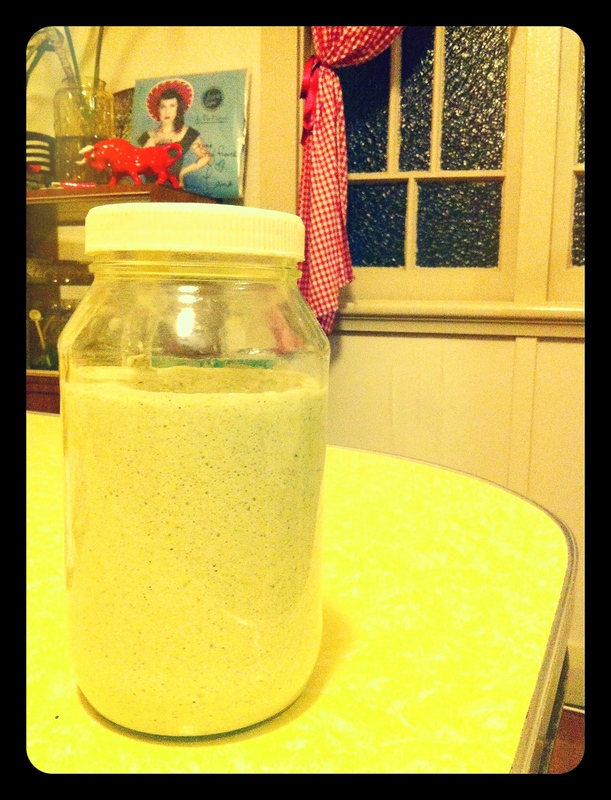 I find the blended batter, which has been fermented, lasts just over a week in the fridge. I’ve actually never had a batch go off, I always finish it first. 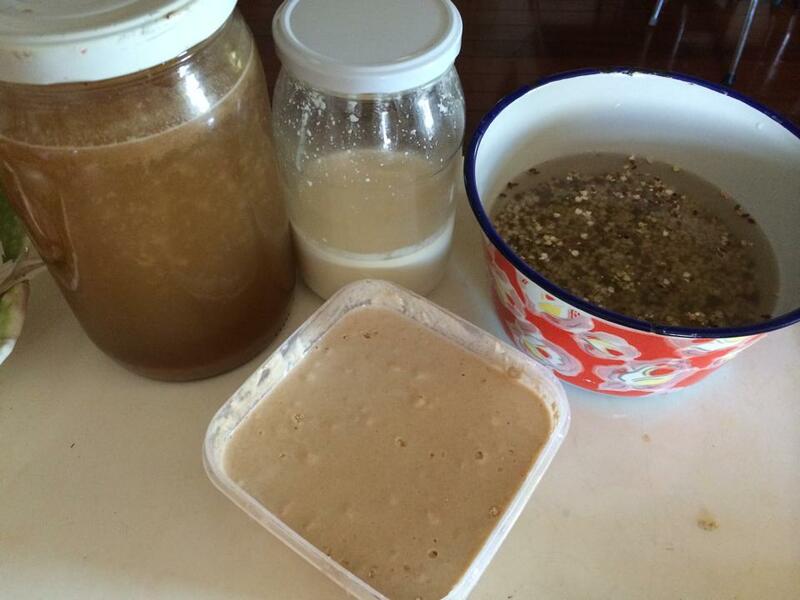 *** NOTE: Some people encourage natural fermentation by leaving the mix out, covered- but WITHOUT adding a starter. This can work. However, it sometimes results in a mix that just goes off. I tend to avoid that method, because I like using some kind of starter to inoculate my batter with(a specific good bacteria), but I do have friends who enjoy success (most of the time) fermenting without a starter. Blended and fermented mix is ready to be stored in the fridge. Lasts approximately 1 week. STEP 5- COOKING- The reason I don’t make up a whole batch of breads at one go and keep them, say, in a bag the way you would get them if you bought them, is that these tend to dry out quite quickly. They really are best made to order. They don’t take much time to prepare at all luckily, so that’s not been an issue. In fact, I often get the dosa on cooking whilst I’m chopping up salad or veggies for steaming, and then use the hot pan I’ve cooked the dosa in to either saute some mushrooms, cook eggs or organic chicken ect… to put on my flat bread. The other thing to point out, is that these flat breads are more like a crepe or pancake. They are quite soft and while you can roll things up in them, I do prefer to eat them with a knife and fork. But who am I to stop you gettin’ right in there and living large? Get messy and go crazy!! I heat the pan, and add about a teaspoon of oil- usually coconut oil or extra virgin olive oil, however ghee is also great to work with. I use a non stick pan that is supposed to be free of the normal chemicals that teflon ect… contains. Cast iron works too, but imagine what pan you’d like to cook pancakes on… they do have a tendency to stick- at least the first one does. Also, the batter contains NO gluten, so it won’t stick together in the same way pancake batter made from wheat will. 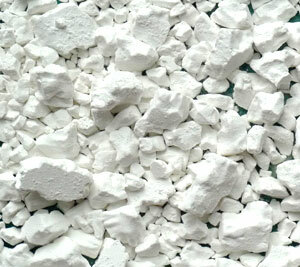 It is necessary to give it a bit of a hand making the classic round shape. I use a spoon to help spread the mix in the hot pan- as it cooks you can spread the mix out further and further until you have the shape you are after- a circle with no holes in it. 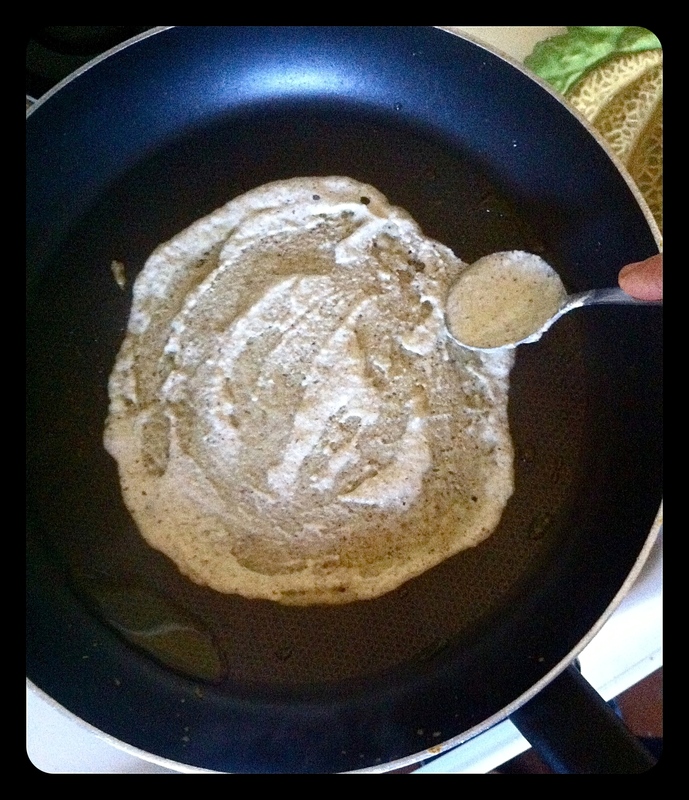 Once the dosa appears to have cooked around the edges, and a few bubbles have begun to appear, you can try to flip it. If the edges aren’t quite solid enough yet, give it another minute and then turn it over to cook the other side. one off-the-hook, fermented, sprouted, gluten free, flat bread! -I usually will have been steaming some vegetables at the same time. Broccoli, beans, snow peas, kale, cauliflower, pumpkin are favourites. On a day when I have more time, I may have roasted some root vegetables, beets, sweet potato, pumpkin, parsnip etc. -I may even just have leftovers from the previous nights dinner and simply eat it as an accompaniment, the way you would bread or crackers. Basically ANYTHING GOES! Put peanut butter and honey on that sucker and roll it up for a quick snack- whatever works for you, use you imagination. 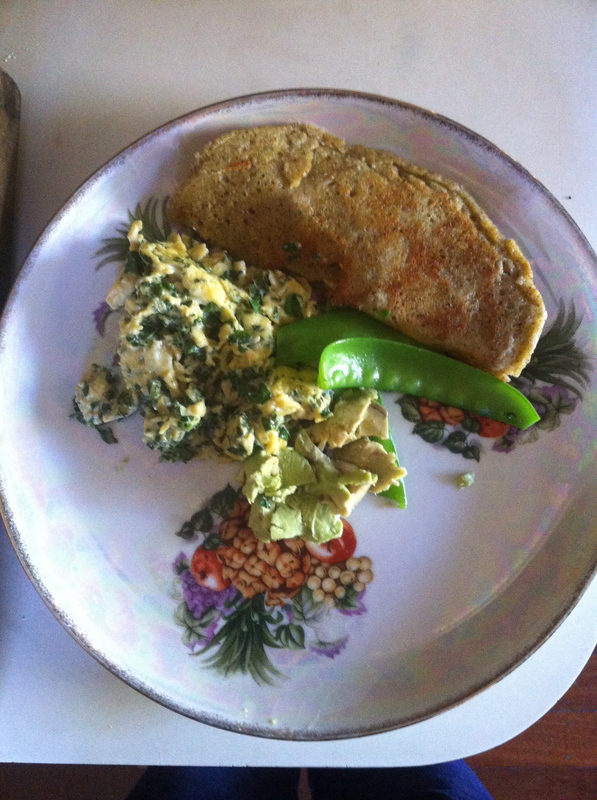 This is a quick lunch I made my 4 year old daughter- scrambled eggs with kale and goats feta, avocado and snow peas- dosa on the side. 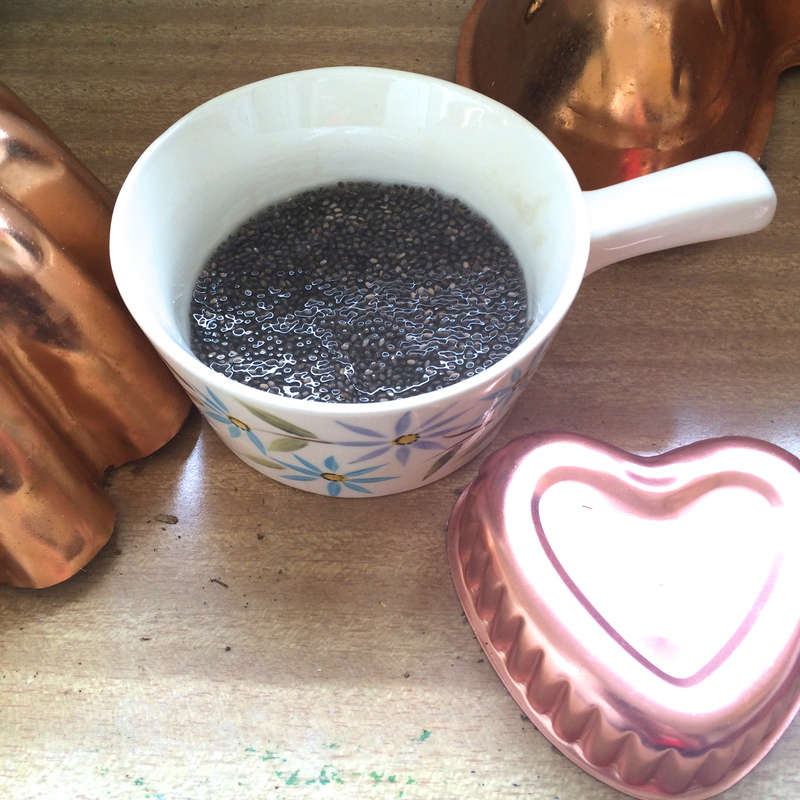 I’ve experimented using lentils instead of mung beans. 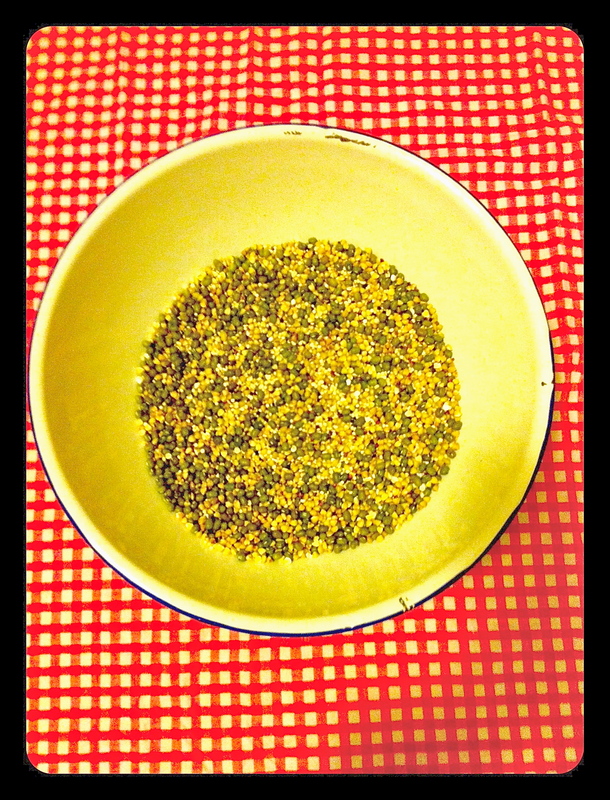 I’ve added soaked seeds like sunflower and pepita and added them to the mix. I’ve blended in fresh herbs from the garden, like basil or dill or thyme. I’ve grated carrot in to the batter before cooking. Really, there is no end to the variations… Once you’ve tried it and seen HOW quick and easy this flat bread is, there’s no turning back. You can scratch one more lifeless, nutritionally void, dubious contents, processed carb off your list of daily foods… AMAZING.